West of Glasgow, leading to the Erskine Bridge across the Clyde. This is one of the shortest, narrowest and generally pathetic motorways that there is. Let's start with the length. If you come onto the M898 from the M8, the sliproads are all narrow and tight, so require great care, and a relatively low speed. By the time you straighten up, and collect the other lane, it's time for the "End of Motorway" signs and the former site of the bridge toll booths. Coming the other way off the bridge, it's about the only motorway that required a standing start to be made for all traffic. OK, so that's the lack of length dealt with; how about the width? The sliproads to and from the M8 are all single lane. The sliproads for junction 1 (avoiding the bridge and the tolls) are all one lane wide. The width increase for the old toll booths doesn't really happen until you're off the motorway, and there are NO hard shoulders, just a layby if you're heading away from the bridge. Would it be here if it was any good? Seriously, though, I guess it gets traffic off and on the bridge fairly effectively. Can I see some photographs of this then?? Yes the slip roads are narrow, however, what you fail to have noticed (or more likely I forgot to tell you) is that they used to be 2 lanes - all of them! Yup, you could overtake an HGV through the underpass! 'Hmm, blind, narrow, single lane sliproads.' Again used to be 2 lanes. Also used to have the largest, most unsettling seam in the tarmac of any piece of road I know. 'a tiny merge' - check the previous photo! This junction has some of the best visibility on the network. The slip is open enough that you're usually going quicker than the M8 anyway. Besides I would wager that over 50% of the traffic heading west on the M8 leaves at J30 anyway. I write in defence of the poor old M898. For five whole years it was actually the western terminus of the M8 (before the Bishopton Bypass Phase 2 was complete). 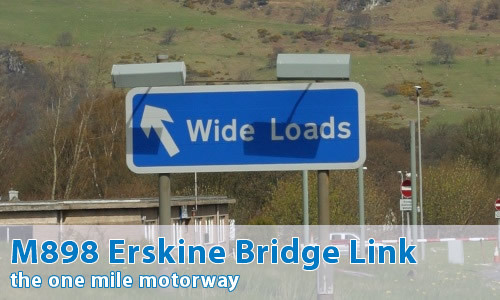 And it does exactly what it says on the tin - gets you to the Erskine Bridge quickly. For those people coming from the north and wishing to avoid Glasgow, the Bridge and the M898 make a welcome sight. There are those who say it should just be a spur of the M8- well I’m not one of them. It’s got a unique distinction (will there ever be an M1000?) and it’s one of the oldest parts of the Scottish motorway network. Looking at the pictures on your website and the map, the sliproads for junction 1 (which is a single-lane dual carriageway) appear to have motorway restrictions in one direction but not the other. Pretty pathetic. I personally think this is the best Motorway in the UK. Without it I would be very stuck and have to drive around the city to get to the A82! It may be pathetic but it is very very handy and those bends are nothing after you have been on an American Highway sliproad. Believe me!